Losing a dog is a very painful process. At times, losing your dog can come as a complete surprise, and at other times, it may be something that you know is coming at any point in time. Both situations are still very hard to handle. Hopefully you have been doing some thinking ahead of time how you are going to handle the loss of your dog, and what you plan on doing with his body. Especially if losing your dog came at a complete surprise, it is hard to think clearly on how you want to handle your dog’s remains. There are some options available for how to handle your dog’s remains from a dog cemetery, a dog cremation service to burying your dog in your yard. I am going to go through options to hopefully help you in a time of need. There are currently over 400 dog cemeteries across the United States. A quick search in google would help find if there is local pet cemeteries in your area. If you find one that is reasonably close to where you live, this will give you the option to lay your dog somewhere peaceful and you would be able to visit your dog’s site. The cost of a burial will range on the location and what you need in their services. Pricing will range from $400 to $600. This will include a plot for your dog and the cemetery digging the grave as well. Most cemeteries will require that your dog is buried in a casket. Caskets can run from $50 to $500 depending on what you choose and depending on if the material is wooden or plastic. Tombstones would be another expense that you would incur. Most places will allow you to provide your own site marker, and you may decide to go with something that you have made. If you are looking to purchase a tombstone for your dog, expect to pay between $150 to $1000. Again, this pricing depends on your choices and how much you will want to spend. It seems that more and more pet owners are choosing to have their dog cremated. This allows your dog to come home with you, move with you if you later move, or place your dog’s ashes somewhere special for you and your dog. I have had my last 3 dogs cremated, and it is nice having them around. Their boxes get a little pat from time to time as I look at them, think about them, or dust around them. There are different cremation services that you can choose from. You can do a communal cremation and it will cost you around $25. With a communal cremation, you will not get your dog’s remains back. There is also a private cremation. This is what you would want to choose if you are planning on bringing your dog’s ashes back home with you. The cost of a private dog cremation will cost between $50 to $150, depending on your location. Make sure you let the crematorium know ahead of time if you want your dog’s ashes back. This cost of private cremation will not include the cost of an urn for your dog. Your dog’s ashes will be placed in a plastic bag and then put in a cardboard box. There are many choices for urns for cremated dogs. Most crematoriums will have additional options for you to choose a special urn for your dog at the time of your services if you choose. From personal experience, I have to say it is very hard choosing this out of a catalog at the same time that you feel broken from losing your friend. This task has felt next to impossible for me when I tried to handle it at the same time. If it is too hard of a process to do right when you lose your dog, wait. Don’t make a decision at this point. 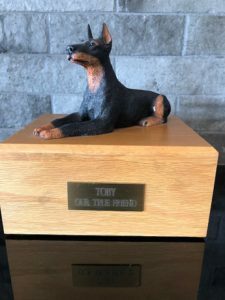 There are many very special dog urns that you can purchase at a later date when you feel ready. 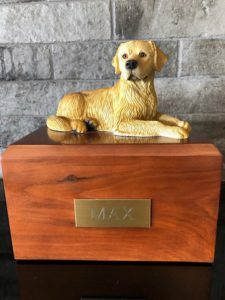 Options will include the vase type urn, ones that allow you to display your dog’s picture, or urns that have a ceramic dog of whatever breed you have. Either take your time when the unthinkable happens, or plan ahead so you have one less painful thing to decide that day. Most veterinarian’s offices or crematoriums might ask you if you would like a paw print from your dog. I do recommend having this done. It is a wonderful remembrance. If they don’t ask you if you want, ask them to do it for you. There will be an extra fee for this, but it is a fairly low cost. If your dog dies at home, contact your veterinarian. They will be able to give you a great recommendation for a crematorium. They will also be able to let you know if the crematorium would be able to pick your dog up from your home. Many do offer this service. You might decide that you would like to bury your dog at your own home. In most locations you are allowed to bury on your property as long as you own the property. You would want to check with your state and local laws to find out for sure if this is an option for you. Choose a spot that you know won’t have to be excavated at a later time, to not disturb your dog’s grave. Your dog should be buried in something that is biodegradable like a blanket or a wooden, wicker or cardboard coffin. Bury your dog 3 feet to 4 feet down and mound the dirt as it will later settle. This will safeguard your dog’s grave against scavengers or other animals from digging up the grave. 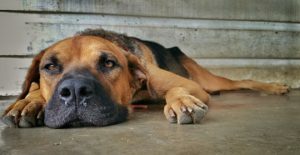 Losing a dog is never easy, but the pain might be slightly less if you plan ahead and have to make fewer decisions on the fateful day that you lose your dog. 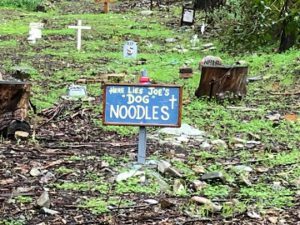 Make a plan and decide if you want to have your dog buried at a dog cemetery when that times comes. That will give you time to find a local pet cemetery that is fitting for you. If you think having your dog cremated is what works best for you, decide if you want your dog’s remains back by having a private cremation, or if not receiving the remains back in a communal cremation. The best place to find information for dog cremation services would be through your veterinarian. They should be able to send you in the best direction. If none of these choices are what you are looking for, or if you are not willing or able to afford these choices, I recommend contacting your local Humane Society. They would also be able to help you with the handling of your dog. Grieving the loss of your dog can be very difficult. Take time to process it, and everyone will bounce back at a different pace. There are many great ideas of ways to help grieve your dog or honor your dog. There are also many ideas that are reasonable priced to help you commemorate your friend from special picture frames, wind chimes or yard markers. It is a hard time, either plan ahead knowing ahead of time what your plan is, or take your time making your decisions on that day. You don’t want to later regret which choice you made, but it is easier making the choices when your brain is clear. If you have any questions or comments, please leave them below and I will get back to you. You can follow justforyourdog.com on Pinterest, FaceBook or Twitter for all the latest updates.